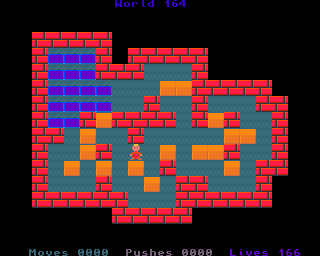 World one hundred and sixty-four is very hard puzzle, where the final boxes are very tricky for placement. Go LEFT, UP, LEFT and push LEFT. Push DOWN, go LEFT, push UP, UP, UP, UP, UP, go RIGHT, UP and push LEFT. Go DOWN, DOWN, DOWN, DOWN, DOWN, DOWN, LEFT, DOWN, DOWN, RIGHT, push UP, UP, UP, UP, UP, UP and UP. Go DOWN, DOWN, DOWN, DOWN, DOWN, DOWN, DOWN, RIGHT and push UP. Go LEFT, UP, UP, RIGHT, RIGHT, RIGHT, DOWN, DOWN, push LEFT, LEFT, go DOWN, LEFT, push UP, UP, UP, UP, UP, UP, go LEFT, UP, push RIGHT, go DOWN, RIGHT and push UP. Go DOWN, DOWN, LEFT, DOWN, DOWN, RIGHT, RIGHT, RIGHT, DOWN, RIGHT, RIGHT, DOWN, push LEFT, LEFT, LEFT, LEFT, go DOWN, LEFT, push UP, UP, UP, UP, UP, UP, go RIGHT, UP and push LEFT. Go DOWN, DOWN, DOWN, DOWN, DOWN, DOWN, RIGHT, RIGHT, RIGHT, RIGHT, RIGHT, UP, UP, RIGHT, RIGHT, DOWN, push LEFT, LEFT, LEFT, go DOWN, LEFT, LEFT, LEFT, LEFT, UP, UP, RIGHT, RIGHT, RIGHT, push DOWN, go RIGHT, DOWN, push LEFT, LEFT, LEFT, go DOWN, LEFT, push UP, UP, UP, UP, UP and UP. Go DOWN, DOWN, DOWN, RIGHT, RIGHT, RIGHT, DOWN, RIGHT, RIGHT, RIGHT, RIGHT, DOWN, RIGHT, RIGHT, DOWN, RIGHT, RIGHT, UP, UP, RIGHT, UP, UP, LEFT and push DOWN. Push LEFT, LEFT, LEFT, LEFT, go DOWN, DOWN, RIGHT, RIGHT, DOWN, RIGHT, RIGHT, UP and push UP. Go RIGHT, UP, push LEFT, go DOWN, DOWN, DOWN, LEFT, LEFT, UP, push RIGHT, go DOWN, RIGHT, push UP, go LEFT, LEFT, LEFT, LEFT, UP, UP, RIGHT, RIGHT and push DOWN. Push LEFT, LEFT, LEFT, LEFT, LEFT, go DOWN, LEFT, LEFT, LEFT, LEFT, UP, UP, RIGHT, RIGHT, RIGHT, push DOWN, go RIGHT, DOWN, push LEFT, LEFT, LEFT, go DOWN, LEFT, push UP, UP, UP, UP, UP, go LEFT, UP, push RIGHT, go DOWN, RIGHT and push UP. Go RIGHT, RIGHT, RIGHT, RIGHT, UP, RIGHT, RIGHT, push DOWN, DOWN, DOWN, DOWN, go RIGHT, DOWN, push LEFT, LEFT, LEFT, LEFT, go DOWN, LEFT, LEFT, LEFT, LEFT, UP, UP, RIGHT, RIGHT, RIGHT and push DOWN. Go RIGHT, DOWN, push LEFT, LEFT, LEFT, go DOWN, LEFT, push UP, UP, UP, UP, UP, go LEFT, UP, push RIGHT, RIGHT and RIGHT. Go DOWN, LEFT, LEFT, DOWN, DOWN, RIGHT, RIGHT, RIGHT, DOWN, RIGHT, RIGHT, UP and push RIGHT. Go LEFT, DOWN, LEFT, LEFT, UP, LEFT, LEFT, LEFT, UP, UP, RIGHT, RIGHT, RIGHT, RIGHT, UP, RIGHT, UP, RIGHT, RIGHT, DOWN, DOWN, DOWN and push DOWN. Go RIGHT, DOWN, push LEFT, LEFT, LEFT, LEFT, go DOWN, LEFT, LEFT, LEFT, LEFT, UP, UP, RIGHT, RIGHT, RIGHT and push DOWN. Go RIGHT, DOWN, push LEFT, LEFT, LEFT, go DOWN, LEFT, push UP, UP, UP, UP, go LEFT, UP, UP, RIGHT, RIGHT, DOWN, push LEFT, go UP, LEFT and push DOWN. Go RIGHT, DOWN, DOWN, RIGHT, RIGHT, RIGHT, DOWN, RIGHT, RIGHT, RIGHT, RIGHT, RIGHT, DOWN and push RIGHT. Go DOWN, RIGHT, RIGHT, UP, push UP, go RIGHT, UP, UP, LEFT and push DOWN. Push LEFT, LEFT, LEFT, go DOWN, LEFT, LEFT, LEFT, LEFT, LEFT, UP, LEFT, LEFT, LEFT, UP, UP, RIGHT, RIGHT, RIGHT, RIGHT, UP, RIGHT, UP, RIGHT, RIGHT, DOWN, DOWN, DOWN and push DOWN. Go RIGHT, DOWN, push LEFT, LEFT, LEFT, LEFT, go DOWN, LEFT, LEFT, LEFT, LEFT, UP, UP, RIGHT, RIGHT, RIGHT, push DOWN, go RIGHT, DOWN, push LEFT, LEFT, LEFT, go DOWN, LEFT, push UP, UP, UP, UP, go DOWN, RIGHT, RIGHT, RIGHT, DOWN, RIGHT, RIGHT, RIGHT, RIGHT, RIGHT, RIGHT, UP, RIGHT, RIGHT, UP, UP, LEFT, LEFT and push DOWN. Go UP, RIGHT, RIGHT, DOWN, DOWN, LEFT, push LEFT, LEFT, go DOWN, LEFT, LEFT, UP and push RIGHT. Go UP, UP, UP, UP, LEFT, LEFT, DOWN, LEFT, DOWN, LEFT, LEFT, LEFT, UP, LEFT, LEFT, DOWN and push RIGHT. Go DOWN, DOWN, RIGHT, RIGHT, RIGHT, DOWN, RIGHT, RIGHT, RIGHT, RIGHT, RIGHT, RIGHT, UP, push LEFT, go DOWN, LEFT, LEFT, LEFT, LEFT, LEFT, go UP, LEFT, LEFT, LEFT, UP, UP, UP, RIGHT, RIGHT, DOWN, RIGHT, RIGHT, UP, RIGHT, UP, RIGHT, RIGHT, DOWN, DOWN, DOWN and push DOWN. Go RIGHT, DOWN, push LEFT, LEFT, LEFT, LEFT, go DOWN, LEFT, LEFT, LEFT, LEFT, UP, UP, RIGHT, RIGHT, RIGHT and push DOWN. Go RIGHT, DOWN, push LEFT, LEFT and LEFT. Go RIGHT, RIGHT, RIGHT, RIGHT, UP, RIGHT, RIGHT, RIGHT, RIGHT, DOWN, DOWN, RIGHT, RIGHT, UP and push UP. Go RIGHT, UP, push LEFT, LEFT, LEFT, LEFT, go DOWN, LEFT, LEFT, LEFT, LEFT, LEFT, UP, LEFT, LEFT, LEFT, UP, UP, UP, RIGHT, RIGHT, DOWN, RIGHT, RIGHT, UP, RIGHT, UP, RIGHT, RIGHT, DOWN, DOWN, DOWN and push DOWN. Go RIGHT, DOWN, push LEFT, LEFT, LEFT, go RIGHT, RIGHT, RIGHT, RIGHT, DOWN, DOWN, RIGHT, RIGHT, UP and push LEFT. Go DOWN, LEFT, push UP, UP, go DOWN, RIGHT, RIGHT, UP, UP, LEFT, push LEFT and LEFT. Go DOWN, LEFT, LEFT, LEFT, DOWN, LEFT, LEFT, UP, UP, LEFT, LEFT, LEFT, UP, UP, UP, RIGHT, RIGHT, DOWN, RIGHT, RIGHT, UP, RIGHT, UP, RIGHT, RIGHT, DOWN, DOWN, DOWN and push DOWN. Go LEFT, LEFT, DOWN, DOWN, LEFT, LEFT, UP, UP, LEFT, LEFT, LEFT, UP, UP, push RIGHT and RIGHT. Go LEFT, LEFT, DOWN, DOWN, DOWN, LEFT, DOWN, DOWN, RIGHT, push UP, UP, UP and UP. Go DOWN, RIGHT, RIGHT, RIGHT, DOWN, DOWN, RIGHT, RIGHT, UP, UP, RIGHT, RIGHT, UP, UP, UP, UP, LEFT, LEFT, DOWN, LEFT, push LEFT and LEFT. Go DOWN, LEFT, push LEFT, go UP and push RIGHT. Go LEFT, DOWN, DOWN, DOWN, DOWN, DOWN, RIGHT and push UP. Go DOWN, RIGHT, RIGHT, UP, UP, LEFT, push LEFT, go DOWN, LEFT, push UP, UP, UP, go RIGHT, UP and push LEFT. Go DOWN, DOWN, DOWN, RIGHT, RIGHT, RIGHT, DOWN, DOWN, RIGHT, RIGHT, UP and push LEFT. Go DOWN, LEFT, LEFT, LEFT, UP, UP, RIGHT, RIGHT, push DOWN, go RIGHT, DOWN, push LEFT, LEFT, LEFT, go DOWN, LEFT, push UP, UP, UP, UP and UP. Congratulations. You have completed world one hundred and sixty-four. Get ready for world one hundred and sixty-five.